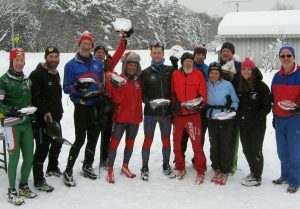 Overnight Lake Effect Buries Osceola Pie Race – NYSSRA Nordic Inc. The loose and dry snow from Lake Ontario’s effect began early Saturday morning to drop 12 inches by 6 am. and continued through most of the day. Camden Nordic’s annual World Famous Osceola Pie Race seemed in jeopardy for the scheduled high school, Bill Koch and U18 / Masters classic races. However, Osceola Tug Hill XC Ski Center’s Hugh Quinn and Camden Nordic’s Coach Moore worked feverishly to pack the 5k course and put down a semblance of a classic ski track. It helped that the high school Modified and Varsity skiers raced first at 10:30 am to establish the track for the Masters start at 11:15. Yet the snow continued to fall and challenged every racer to find a track and maintain visibility through the flakes. Eskimo Pies – Believe it or not, there were over two dozen pies on this prize table. 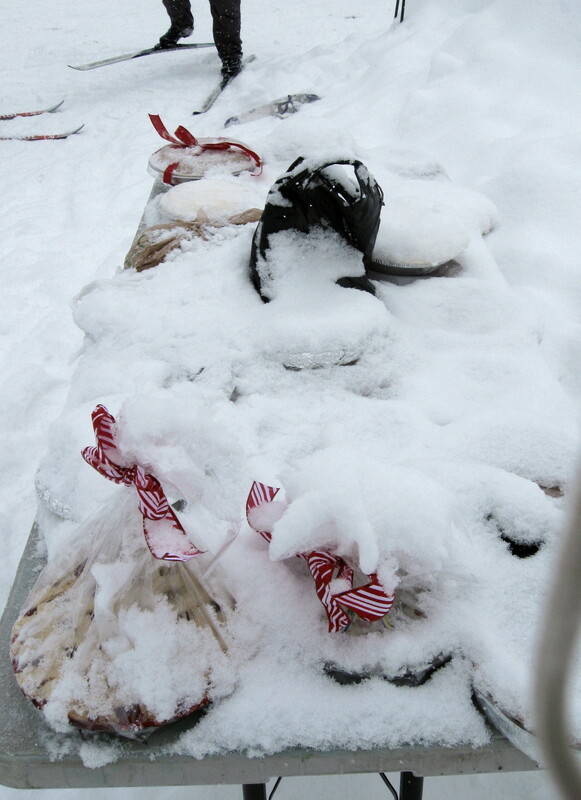 Snow quickly covered the goods and the 20 degree temperature froze many of them solid. Eric Seyse (0:20:18) and Audrey Ballander (0:31:27) were the overall men and women Masters winners respectively. Mayfield Nordic’s Madison Relyea (0:25:13) and Antonio Mannion (0:25:45) were the girls and boys U18 winners respectively. Complete results are HERE. 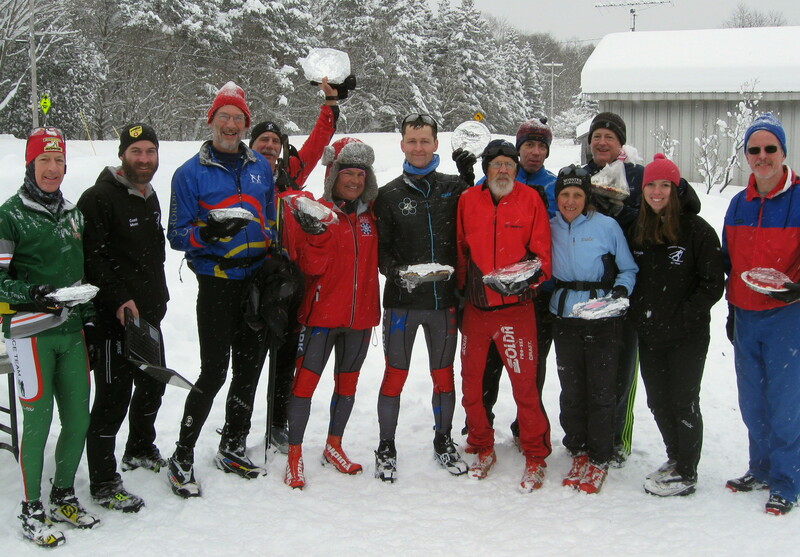 Awards (rewards) – Age group winners pose with their pies baked by race host Camden Nordic Ski Team parents, members and volunteers.